This picture was taken in our back yard. Only the adult male purple martin (Progne subis) is actually purple, and only after his second year. Females and immature males have a lighter colored front. 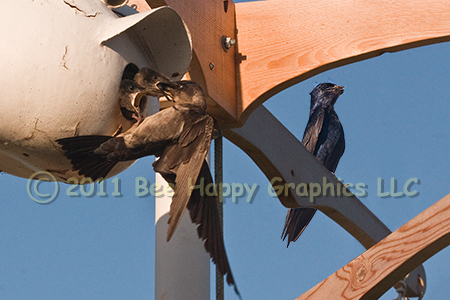 The purple martin is one of our native songbirds. They fly in at the end of January to raise four to six young, and in early August they all leave for Brazil. As cavity dwellers, they are threatened by exotics like the European starling and the house sparrow, who like to steal their nest sites. In this picture the male stands by with a dragonfly while the mother feeds another dragonfly to one of the chicks. Notice her foot is in the mouth of the other chick. Photographic details: Canon EOS 30D camera w/ EF 100-400mm f/4.5-5.6L IS USM lens set at 360mm. Flash was not used. Camera was on f/14 for 1/800 sec (shutter priority) at ISO 800. Fine Art Paper 11" x 14" 111/2" x 151/2"
Canvas N/A 141/2" x 20"